Hi my name is Davonte and I worked as one of Augsburg’s Campus Kitchen summer Step-up interns and it was my first ever job experience. Over the summer I’ve acquired a variety of job experiences and practiced many skills such as cooking, gardening, and researching food systems. 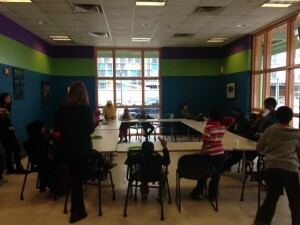 Every Monday through Thursday I served food with the youth at the Brian Coyle Center and on Saturday I participated in the gleaning at the Mill City Farmer’s Market where we collected fresh donations of produce and gave it elders at The Cedars senior apartment building in Cedar-Riverside. It was a lot of hard work but it was also very fun and well worth the time. For example, going to the Guthrie Theatre during my shift on Saturday to enjoy the views made the time go so much faster. This summer while cooking I learned new things such as new recipes made from fresh and healthy ingredients that ended up tasting really good like zucchini muffins and cucumber popsicles. Also one of my favorite parts of the job was just making other people happy by giving them food. It’s a rewarding experience. Hey, my name is Raykel and this past summer I worked for Campus Kitchen through the Minneapolis Step Up program. “What’s Campus Kitchen you ask?” Well Campus Kitchen is a food organization that is basically built off of donations. Any food not used in the Augsburg kitchen that has already been prepared but wasn’t eaten is given to Campus Kitchen to be reused. We have a wide variety of the kinds of food that we get, although once the food is put into the fridge we have a week to use it and most times it gets used and if not we freeze it. Another question you probably have is “Where does the food go once prepared everyday?” Well, Monday-Thursday the food is made and distributed to the Brian Coyle Center, for the children and even the adults (depending on how much we have left) but kids always eat first. Fridays, twice a month we take food to the elders at Ebenezer Tower Apartments and eat dinner with them. Campus Kitchen is like an organization that is always giving back to the community. Did I mention the garden where the community gets together and grows what they want to? This job gives many opportunities. For instance, you meet people at a college and you learn things about the college that you didn’t know before. Also, you can put it on your resume. Plus if you ever need a job when you come to college then you know a place that you don’t even have to leave campus for. There were many memories and skills that we made and learned over the summer but there’s a couple that stand out to me: knowledge of plants and knowledge of cooking in the kitchen. For two weeks in the summer time we had a gap in our schedule because the Brian Coyle Center was shut down so we helped out MN Urban Debate League camp. During, before, or even after their lunch we always could eat lunch so who wouldn’t go back for 3rds? This job helped me gain a lot of knowledge about many things and I’m very grateful for a great job. When most people think of nursing, the first association that comes to mind is not usually “political.” But the Nursing Department at Augsburg College, in partnership with staff at the Sabo Center for Democracy and Citizenship, is encouraging their students to think of nursing as just that: public, change-making work, focused on relationship-building, public dialogue, and grassroots efforts in local context. Beginning in 2009, the Augsburg College Nursing Department began collaborating with the Sabo Center, bringing in Public Achievement Organizer Dennis Donovan to teach graduate students about beginning organizing skills, such as one-to-one relational meetings. In the years since, the Augsburg nursing program has turned to social change-making as a key component of its course curriculum, focusing on the social barriers to health in addition to bedside care. After receiving a grant from the Augsburg College president’s office in 2014, the Nursing Department worked with Sabo Center staff to train department faculty about civic skills and to subsequently embed these concepts into curriculum and coursework. Such core civic skills include one-to-one relational meetings, formulating public narrative, deliberative dialogue, power mapping, and public evaluation. The collaboration with the Sabo Center has complimented the nursing department’s commitment to transcultural nursing, a model for nursing that holistically considers culture, life patterns, and other social factors while providing culturally competent care. Health and people are viewed not as discreet cases, but as individuals who are incorporated into webs of relation and inhabit different ways of being in the world. Nursing thus becomes concerned with community health, examining how and where people belong, the strength of human connections, and health inequities. Rooted in community-based praxis, nursing professionals know not only how to administer direct care, but how to build relationships, formulate a public narrative about community health, and advocate for change. 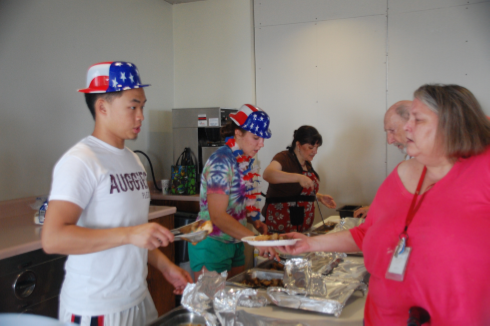 The community-based, transcultural focus of Augsburg’s nursing program has also intersected with another Sabo Center program, Campus Kitchen. 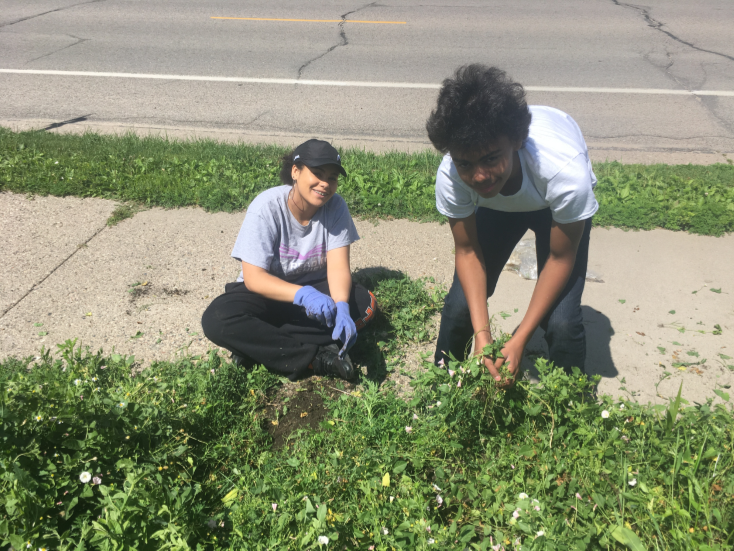 For the past 4 years, the Nursing Department and the Sabo Center have partnered to host an AmeriCorps*VISTA volunteer, with a particular focus on the intersection of the Health Commons and the Campus Kitchen-run Augsburg Community Garden. Through the relationship between the two programs, more Cedar-Riverside residents have been engaged with the garden; additionally, the relationship between Health Commons and Campus Kitchen has been key to the success of the farmer’s market gleaning project, with a neighborhood health liaison hired by Health Commons spreading the word about the program and distributing food. Partnerships and collaboration are a hallmark of the Sabo Center’s work, and the relationship with the Nursing Department embodies our mission to foster civic agency, to help cultivate public, change-making skills, and to forge connections with the local community. Want to learn more? Visit the Health Commons website, the Augsburg College Nursing Department website, the Augsburg Campus Kitchen website, and the Sabo Center website. Grace Corbin preps a meal for one of Campus Kitchen’s partner sites. For Grace Corbin, food justice is not just about making sure everyone can eat. As a participant in Augsburg College’s Campus Kitchen program throughout her four years at Augsburg—this year as a student leader—Grace has come to understand the sharing of food as an essential aspect of breaking down social and cultural barriers. Whether it is through serving food to elders at the Ebenezer Towers, gleaning food from the Mill City Farmers Market, or growing food in the Augsburg Community Garden, Grace sees all of the aspects of Campus Kitchen as opportunities for relationship building with community members, fellows students, and staff. Relationships, she says, are key to building equity when it comes to food access, and health and community well-being more generally. Grace’s time with Campus Kitchen has also allowed her to develop skills and interests that she might not otherwise have explored. 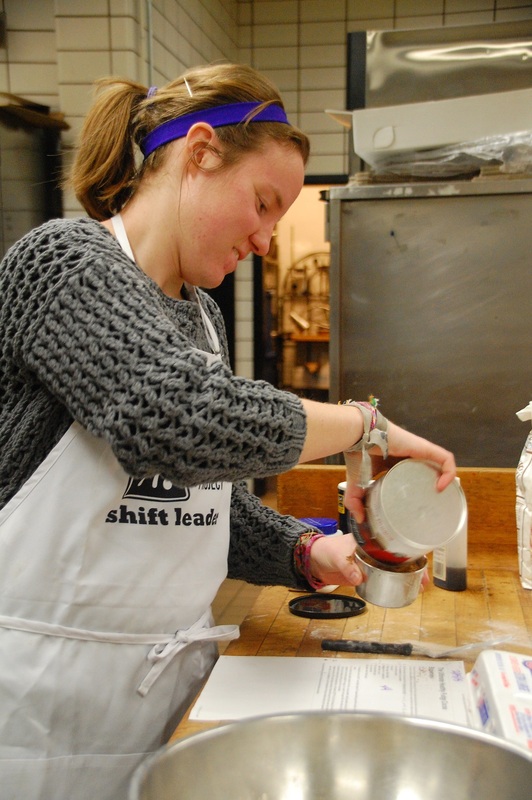 Grace credits her experience with Campus Kitchen—particularly learning about food systems and food waste—as inspiring her interest in environmental sustainability and ultimately her interest in pursuing faith-based environmental work after graduation. Co-leading a student plot in the Augsburg Community Garden and our weekly gleaning efforts this summer provided her with an experiential learning opportunity that quickly pushed her out of her comfort zone to learn about vegetables, event planning, the logistics of food distribution, and the diverse community that surrounds Augsburg’s campus. Grace took on the challenge: “I learned a lot of things about myself…(and) how willing I am to challenge myself.” Participating in Campus Kitchen was even a physical feat: over the course of last summer, Grace and a fellow student lifted over 5,000 pounds (!) of leftover produce from the Mill City Farmers Market and distributed it weekly to elders in a nearby apartment complex. Campus Kitchen at Augsburg focuses on four aspects of food justice: Food to Share (free meals, on-campus food shelf, and gleaning), Food to Grow (community garden), Food to Buy (farmers market), and Food to Know (food education). Interested in learning more about the work of Campus Kitchen through the Sabo Center at Augsburg College? Take a look at our website or check out our day-to-day on Facebook. And you can always volunteer! Contact Campus Kitchen director Allyson Green by emailing greena@augsburg.edu. Cooking and building community with Campus Kitchen! Hello! Kenani and DJ here, Augsburg Campus Kitchen’s summer 2016 Step-Up Interns. 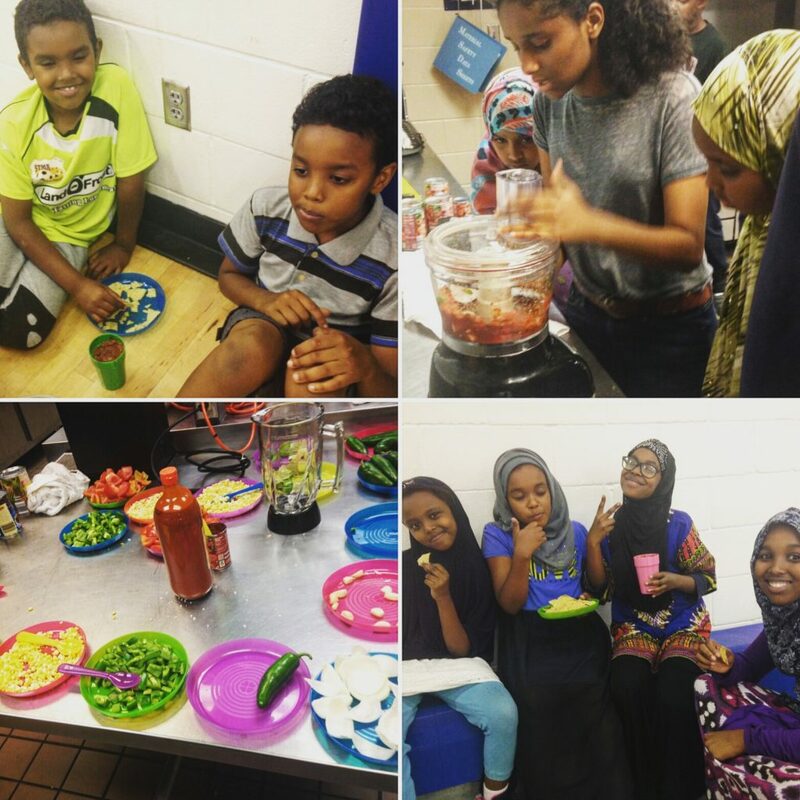 This summer we were placed with Augsburg Campus Kitchen for our first ever job through the City of Minneapolis Step-Up program. All summer we have been cooking and serving meals for youth at the Brian Coyle Center summer program. 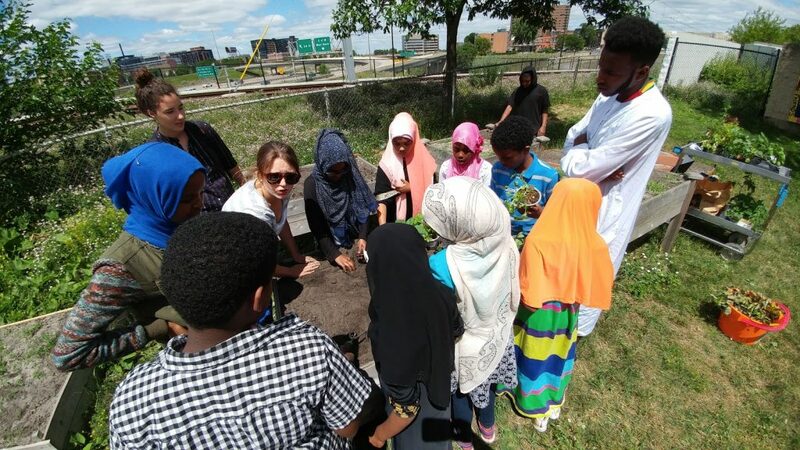 In addition, on Mondays we helped teach gardening, cooking, and nutrition lessons to Brian Coyles’ K-8th graders. The theme for the summer was Top Chef and each week we had a cooking competition and awarded three participants Top Chef of the week. Thanks to grant support from The Campus Kitchens Project, These students were able to bring home a bag of groceries and recipes to their families so they could recreate the meals with them. This past week in Top Chef we had a salsa competition where students were given a certain amount of fake money to buy the fresh ingredients to make their special salsas. The students had to be creative in making unique salsa while still making sure they had enough money to buy all the ingredients for their salsa. The kids had tons of fun making salsa and many of them were surprised how good their salsa turned out. For instance, a few students challenged themselves by putting less common ingredients such as black beans or pineapple in their salsa and still ended up loving it! We were really impressed that almost all the students liked their salsa – we learned it is almost impossible to make bad salsa from fresh ingredients! Throughout the summer we learned about a community that is different than our own. We realized how everyone in Cedar Riverside seems to know each other and how connected they are to their community. Even though we were out of our comfort zone a little at first we were able to make new friends and learn new things, not to mention becoming all-star dishwashers and building our resumes! You can eat processed meats and red meats, but can you digest cancer? As a way to further reflect on their experience with Campus Cupboard, polish their communication skills, and explore new topics related to food and sustainability, Campus Cupboard volunteers will be publishing weekly blogs this fall. Check back each week for new musings from the students! The International Agency for Research on Cancer (IARC), an intergovernmental agency forming part of the World Health Organization (WHO), recently served us a mouthful. On Monday, October 26, the IARC reported that processed meats and red meats are linked to cancer. After analyzing 800 scientific studies, the IARC categorized processed meats as a Group 1 Carcinogenic. Under this category, “there is enough evidence to conclude that it can cause cancer in humans.” Red meats were placed in Group 2A, which means that there is probable cause of cancer, but the evidence is inconclusive. As a way to further reflect on their experience with Campus Cupboard, polish their communication skills, and explore new topics related to food and sustainability, Campus Cupboard volunteers will be publishing weekly blogs this fall. Below, Malia kicks off the “Food and Sustainability Series” by exploring new food adventures. Check back each Monday for new musings from the students! Living in a big and dynamic world, I have a strong passion to travel across the globe, for new adventures and to learn more about the various cultures out there. Food is always a big part of that learning. As a way to further reflect on their experience with Campus Cupboard, polish their communication skills, and explore new topics related to food and sustainability, Campus Cupboard volunteers will be publishing weekly blogs this fall. Below, Oscar kicks off the “Food and Sustainability Series” with a topic he has been interested in learning more about. Check back each Monday for new musings from the students! Last year, Minnesota increased the mandate from a 5 percent minimal biodiesel blend (B5) in its diesel fuel supply to B10. The shift occurred because biodiesel has demonstrated substantial reduction in particulate and greenhouse gas (GHG) emissions. As the statue currently reads, Minnesota will be raising to B20 by 2018. It’s hard to believe summer is almost over – it feels like it just started for us! With a solid team of interns serving weekly meals, supporting the community garden, revamping our farmer’s markets, and teaching gardening and cooking classes, it was a busy but rewarding summer at the Campus Kitchen. We’re looking forward to keeping this momentum going into the school year… but before that happens, we finally have time to catch our breath and share what we’ve been up to for the past 3 months. Check out our summer updates below! In addition to serving 60 packaged lunches to seniors in Phillips and Seward each week, we had a few special events at our Friday community dinners at Ebenezer Tower. 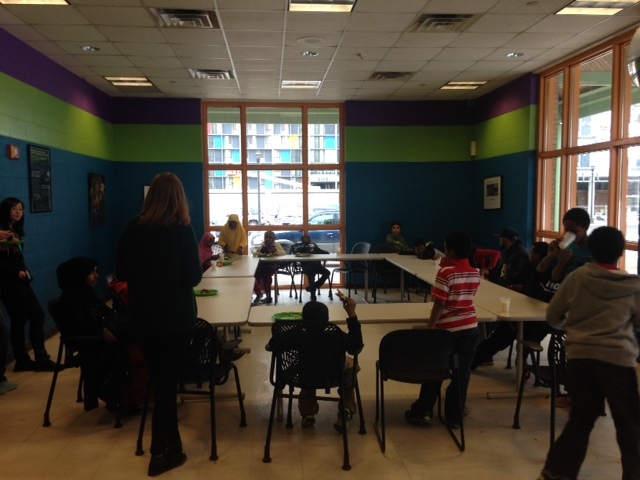 Rhys led an “Easy Cooking & Eating” discussion with residents to share strategies on no-fuss healthy eating. Many thanks to The Campus Kitchens Project and AARP for sharing the curriculum and supporting these new senior outreach efforts! To celebrate Independence Day, we brought our most festive attire, some July 4th trivia, and pies graciously donated by Perkins Restaurant. Recently, Campus Kitchen students joined peers from across the country at the 2015 Food Waste & Hunger Summit, where we networked, shared insights, learned new ideas, and were honored with a “Going Beyond The Meal” award. Check out Emily Campbell’s (’17) reflection and call to action below, and stay tuned for more student reflections! Campus Kitchen goes “green” at Brian Coyle Center! This semester, Campus Kitchen has been able to resurrect a practice that’s both earth-saving and cost-saving with the youth at Brian Coyle Center. A year ago, an intern created a reusable plate system to use with the youth, but the system (and plates) got lost in transitions through the summer and fall. 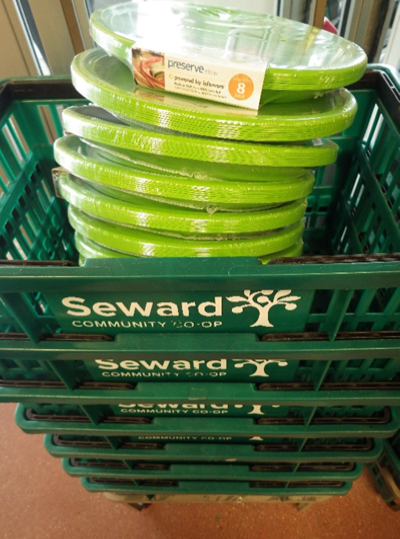 Now, thanks to a donation from Seward Community Co-op, thoughtful clean-up skills from the youth, and a little extra elbow grease from our current interns and volunteers, re-usable plates have returned! 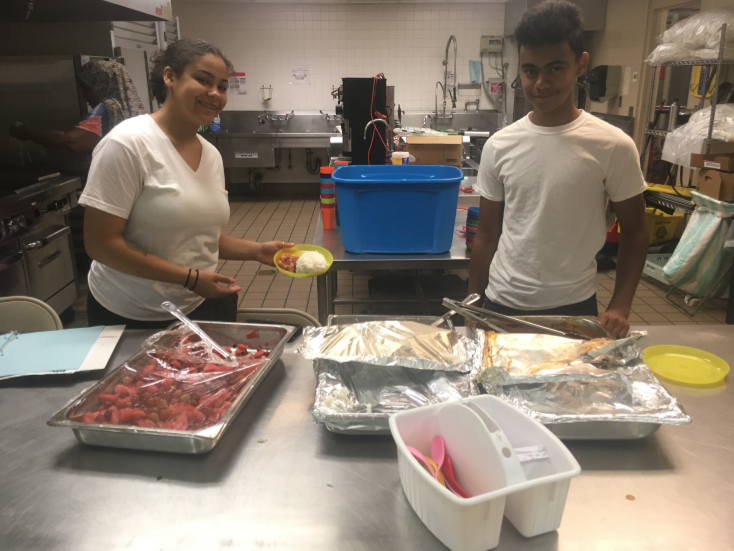 The youth are back in the habit of saving plates every day, and Campus Kitchen students have been able to use the dishwasher at Brian Coyle to make clean-up efficient and effective. These cheery green plates are now saving about 100 Styrofoam plates from a landfill each week!